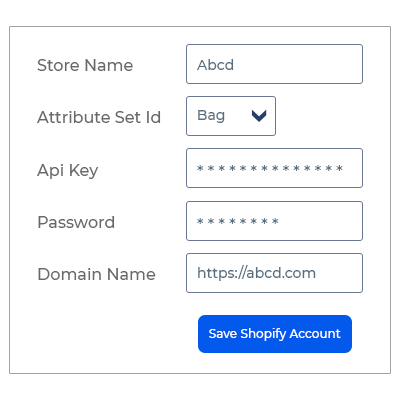 Magento 2 Shopify Connector: Integrate your Magento 2 store with Shopify store and synchronize products, categories, and orders between the platforms. 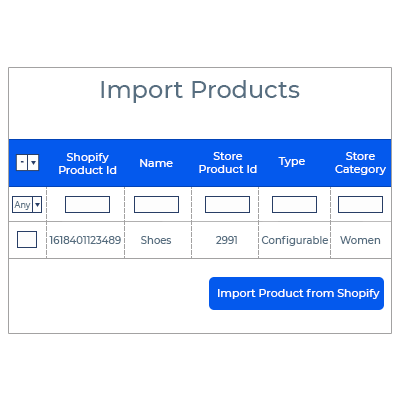 With the help of Magento 2 Shopify Connector module, the merchants can import/export simple and configurable types of products. You can connect multiple Shopify accounts and exchange data with Magento. Magento 2 Shopify Connector: If you are a multi-channel seller on Magento 2 and Shopify store then managing both the stores could be a tedious task. But using the Magento 2 Shopify Connector module, the store owner can integrate the Magento store with the Shopify store. Using the module, the store owner will no longer be required to configure the product data and information on both the stores separately. The store owner can sync the product, orders from Shopify to Magento store. And, can even export the products from Magento store to Shopify. The admin can synchronize the products and orders from the multiple Shopify accounts using the module. Import & export products to the mapped categories automatically. Effortless syncing of products between Shopify and Magento. 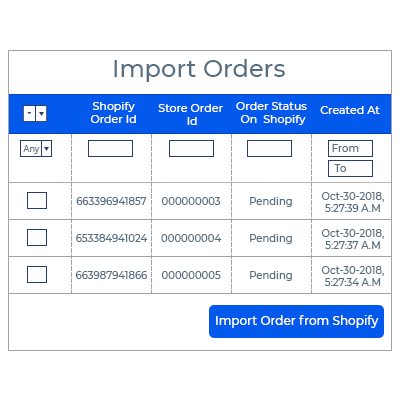 Sync orders from Shopify store to Magento store. Update the price of synced products automatically. Export additional information of the product. The store owner can connect and manage multiple Shopify accounts simultaneously. The admin can add, edit and delete any existing Shopify account. For integrating the Shopify account, the admin just needs to define the Shopify account API key and password. 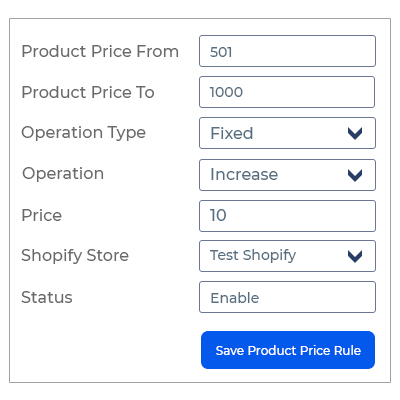 The admin can define product and order sync settings for each Shopify account separately. Only one category can be mapped at a time. You cannot map the parent categories. Import product from mapped and non-mapped Shopify category both. If category mapping is not done for the Shopify product category, then the imported products will be assigned to the default category. But the products will not be exported. If the category mapping is done for the Shopify product category, then the imported and exported products will get assigned to the mapped category only. Manage and sell imported products just like any other Magento product. The module import simple and configurable product types. The admin can even change the category of imported products. Import the Shopify orders to the Magento store manually. And can also import the Shopify orders automatically using cron after every one hour by default. If the order imported via a cron and products of imported order does not exist in Magento 2 store. Then, those products get created automatically in your Magento 2 store first. But if order imported manually and products of imported order do not exist in Magento 2 store. Then, those products should be imported first because they will not get created automatically. If the customer of imported order doesn’t exist in Magento 2. Then, while order import that Shopify customer gets created in Magento 2 automatically. Select as many as products which the admin wants to export to Shopify store. Check the exported product by navigating to the Shopify account. Can edit the exported product details by navigating to the Shopify account. The product information like base image, name, SKU, price, and quantity get exported along with the product. The module export simple and configurable product types. Manage and sell the exported products just like any other Shopify product. These listing templates will export the product’s additional information along with the product. The additional information of the product will be displayed on the Shopify store. 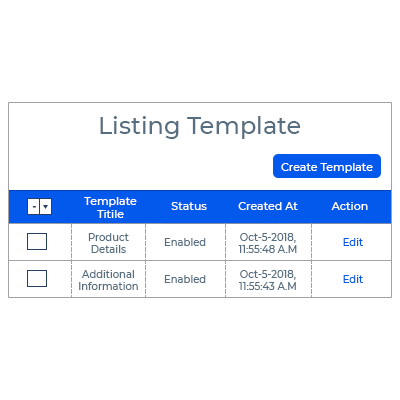 The admin can edit or delete the listing template details. The admin can add or create an unlimited number of listing templates. Add or create an unlimited number of price rules. Update or edit the Price Rules. Define the price rules for each Shopify store as per the choice. 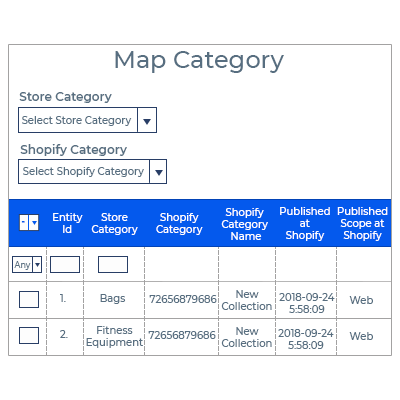 The admin can map Shopify categories with Magento 2 categories. The admin can import Shopify products to Magento 2 store. The admin can set the default quantity for imported products in the Magento 2 store. The admin can import Simple as well as Configurable(product with variants) product types. The product information like base image, additional images, name, price, SKU, description, quantity, weight and super attributes with options get imported along with the product. Imported Shopify product works like same as Magento product. The admin can export Magento 2 store products to Shopify store. 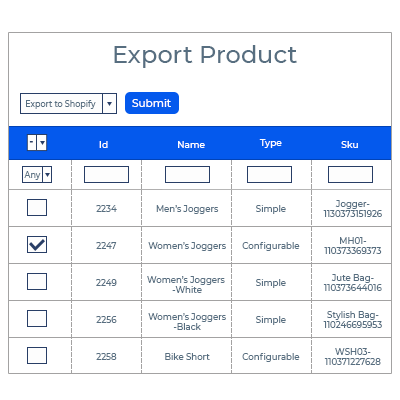 The admin can export Simple as well as Configurable product types. The product information like base image, additional images, name, price, SKU, description, quantity, weight and super attributes with options get exported along with the product. The admin can import Shopify orders to Magento 2 store. Quantity management on Shopify for the orders placed at Magento store. The admin can add multiple Shopify Accounts. The admin can view and manage the Shopify Accounts. Did you buy Magento 2 Shopify Connector? The product information like base image, additional images, name, price, SKU, description, quantity, weight gets imported along with the product. A cron is set for this module for auto synchronization of orders. The admin has to configure the cron on Magento 2 server which will automatically import the orders from Shopify store to Magento 2 store after every one hour by default. The admin can change the default cron time. Will I get the email notifications for any order placed on Shopify store? The admin will not get any Email notifications for any order placed on the Shopify store for the admin products. However, the admin needs to check those orders normally by navigating to Sales > Orders after importing them. Will the products get imported if the category mapping is not done? If category mapping is not done then, the Shopify products will get imported to the default category of the Magento store. Will the products get exported if the category mapping is not done? The Magento products whose category is not mapped with Shopify store category will not get exported. Do customers get created in Magento 2 while order import? If you are importing the Shopify order and that customer doesn’t exist in Magento 2. Then, while order import that Shopify customer gets created in Magento 2 automatically. Will the inventory gets updated if synced product gets sold on either of the stores? If the products that are synced from Shopify to Magento 2 get purchased on Magento 2 store then the inventory sold out is updated on the Shopify store but not vice versa. + Admin can get products from Shopify. + Synchronized Shopify product work like same as Magento product. + Only Admin can add or update Shopify products. + Admin can also sync categories of Shopify product. + Admin can synchronize order from Shopify.